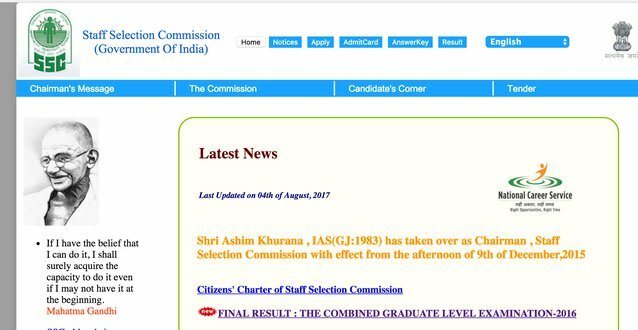 The first day of Combined Graduate Level (CGL) Tier I examination conducted by SSC (Staff Selection Commission) has come to an end. While a majority of the candidates who took the first session informed PaGaLGuY spoke that quant troubled them, many found the same difficulty in the subsequent sessions as well. 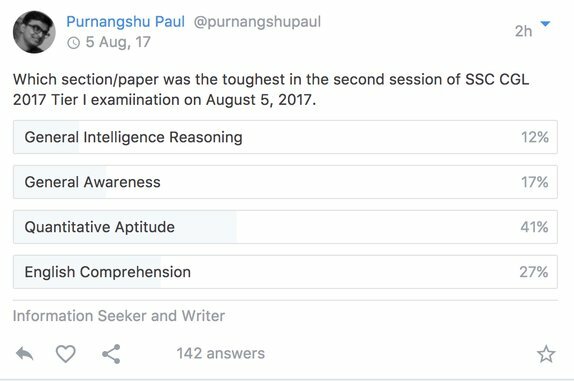 PaGaLGuY conducted a poll on our website asking the aspirants how they found the second and third session of the examination today. We received over 100 responses on each of the polls conducted at the time of publishing this article / story. Almost 40% of the candidates taking the second session examination informed that the examination was moderate and they faced most difficulty in Quant section. Speaking to an aspirant from Kolkata, Prithwiraj Chakraborty, this correspondent got to know that he found the Math paper to be moderate. “English was tough for me, but both reasoning and Mathematics were moderate. The only problem I faced in the quant section was that it took a lot of time for me to finish and resulted in a few known questions left at the end,” said Chakraborty. Chakraborty has completed his Electrical Engineering degree from Kolkata and is pursuing his Master’s degree currently. According to the poll conducted on our website, the third session was termed as moderate by the candidates. It was termed to be tougher than the last year by a majority of the students. 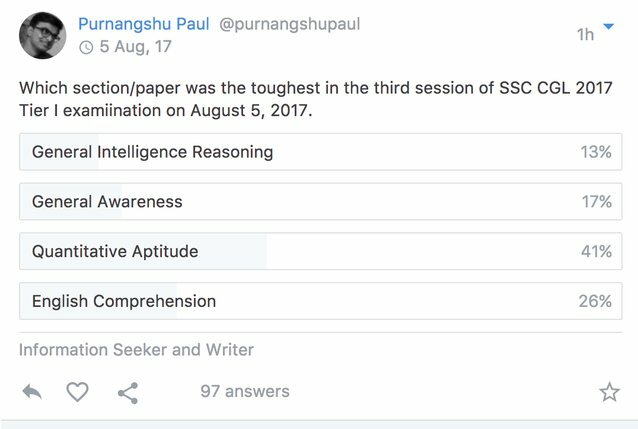 Quite similar to the responses about the most difficult paper, candidates from third session also informed Quant to be the toughest. An aspirant from Kanpur Aakash Gupta, who took the third session today informed that the overall paper was moderate. “Although I am strong in Mathematics, I found the Quant section to be a little tricky and lengthy. Since, I was confident in Math, I started with it and ended up losing important time at the end. Both General Awareness and Reasoning paper were very easy and many were common from the last year questions,” said Gupta. 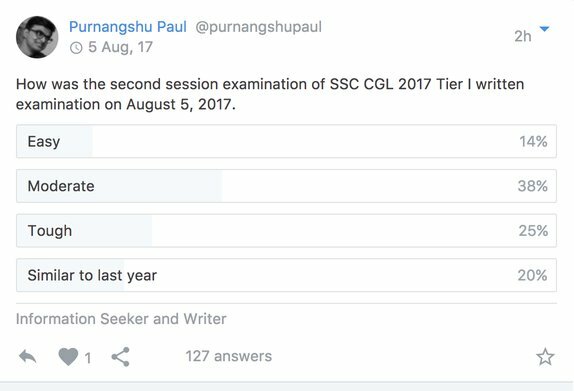 The SSC CGL exams will continue till August 24 with multiple sessions everyday. 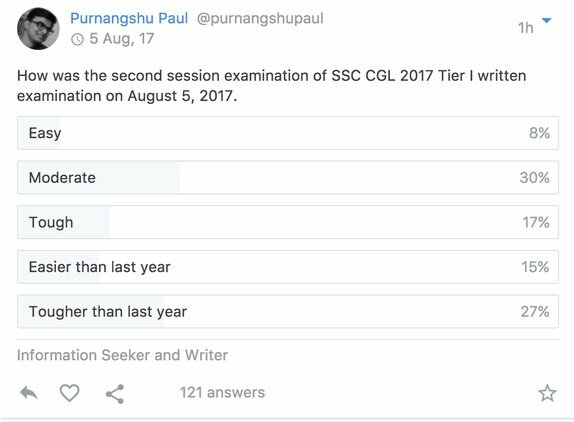 Over 40 lakh candidates have applied for the SSC CGL 2017 and the examination will be conducted in phases over the next couple of weeks in different test centres across the country. Keep an eye on our website for more information and join our discussion platforms. Provide your responses to the poll here.